Alexandra Grey was an Australian delegate at the 2014 Australia-China Youth Dialogue, and ‘Topic Champion’ for the Dialogue’s session on US-China-Australia relations. She is a PhD candidate at Macquarie University, Sydney. The Australian Government appeared to have been caught unawares by the recent China-US emissions reduction announcement at APEC, suggesting – unsurprisingly – that the dynamics of US-China relations evolve without Australia. Nevertheless, there is a real, albeit still emerging three-way relationship between Australia, China, and the US, one in which Australia has much more room to direct its own role. The best illustration of this is Exercise Kowari, the US-China-Australia joint military exercise held in northern Australia in October 2014. At the recent Australia-China Youth Dialogue (ACYD) in Beijing, Australian and Chinese foreign policy experts examined developments in three-way cooperation. This trilateral relationship is not a longstanding axis of the world order. Rather, questions still remain as to whether a distinct and dynamic US-China-Australia relationship will emerge, or whether the three nations will find their goals aligning only on an ad hoc basis. From Australia’s perspective, should its international relations be focused on strengthening a special three-nation relationship, or does Australia best serve its national interests by juggling separate bilateral relationships with the US and China, and as a third wheel to the US-China bilateral dynamic? Exercise Kowari was initially an Australian pipedream that was not considered a priority by China’s People’s Liberation Army (PLA), according to the Defence Attaché at the Australian Embassy in Beijing, Colonel Simon Monterola, who spoke at the ACYD. However, the PLA later realised Exercise Kowari could assist China in moving towards more integrated, sophisticated, and trust-building international cooperation on security matters,. Given the long history of security training and high level dialogue between Australia and China (continuing through the 17th annual Defence Strategic Dialogue just held in Beijing), and the two nations’ joint efforts searching for the missing MH370 jet, China came around to the idea of a trilateral exercise in Australia. But these are baby steps. An obvious further role for Australia, if a particular place in the world order is to emerge for distinct and ongoing US-China-Australia relations, is for Australia to be a broker of friendship between the two bigger players. Nevertheless, Australia is not seeking this role at the moment. According to Col. Monterola, Australia does not see itself as a ‘bridge’ between the PLA and the US military, but it will happily foster increased security cooperation between the two. The Australian, Chinese, and US militaries are “in the trust-building and mutual understanding phase”, he says. That said, Australia would surely benefit from decreased tension between its two most important international partners. 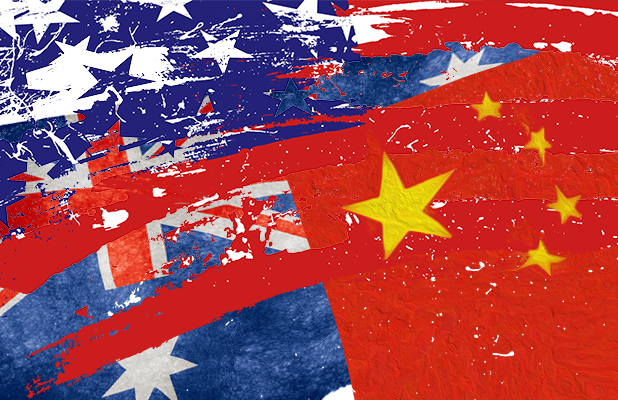 While some commentators argue that Australia does not have to ‘choose’ between China and the US, dichotomous views of China and the US are typical in discourse about Australia’s international relations. There may be a pragmatic middle road Australia can take, instead of picking sides, but this constructed -- and invidious -- ‘choice’ between the US and China is nevertheless going to continue to be an important part of how Australia’s allies perceive and determine the moves Australia makes. Moreover, according to Col. Monterola, others see Australia as a bridge regardless of Australia’s own repudiation of that role, particularly by some Chinese academics. As Australia pursues increased trilateral engagement, it may have to accept this bridging role and actively make the most of it. That would be preferable to building a US-China-Australia tripartite relationship in which Australia is a bridge only in the sense that it gets trampled over. An ideal relationship in which Australia is never ‘in the middle’ seems unrealistic. But if Australia is to be seen by China, and possibly also by the US, as a trusted conduit to a strategic rival, then Australia should take an active role in shaping its own instrumentality. Key opportunities for Australia include joining China’s proposed Asian Infrastructure Investment Bank (AIIB), seen as a not-too-distant eventuality by Jane Perlez, chief diplomatic correspondent in Beijing for The New York Times,. In October, Australia declined to join the AIIB at the request of the US, and against the wishes of Treasurer Joe Hockey. Ms Perlez’s fellow panelist, Professor Zha Daojiong of Peking University, agreed that it was likely Australia would eventually join the AIIB, and in any case Australia still has another year to reconsider its position and become a founding member of the bank. Another key opportunity is likely to come in 2016, when China will hold the G20 presidency. In that same year, China’s “strategic study” of its proposed Free Trade Area of the Asia-Pacific (FTAAP) is due to be completed, and so the FTAAP’s coexistence with the US’s proposed Transpacific Partnership will be on all three nations’ agendas. Further reform of international trade institutions to better accommodate China is also expected for the 2016 G20 agenda, as Hugh Jorgensen wrote recently in China Spectator. Looking more broadly, the emergent US-China-Australia relationship need not move ahead only through small-scale military training operations and big-scale reconfigurations of the international trading system. Australia has the potential to more creatively and strategically construct the trilateral relationship. For example, the new Australia-China Free Trade Agreement opens the way for expanded services trade, especially in education. While a very different platform than military joint exercises or infrastructure banks, international education can have an enormous impact on the influence, and reputation, of one country within another country. In a much more ground-up way, the education sector can contribute to the “mutual understanding” that Col. Monterola says is Australia’s current priority for developing the US-China-Australia relationship. Given the US is currently the university destination of choice for Chinese students, with Australia not far behind, Australia’s increasing educational presence could be a platform for increased exchange of both ideas and people between the three nations. Even without Australia moving towards more multivalent international relations, a facilitative, bridging role in a relationship with both China and the US remains a way to utilise the particular strengths of Australia’s diplomatic reputation, economic standing, and geographic position in order to reduce the mutual suspicion which lingers between the great powers of the West and the East, contributing to better international relations well beyond Australia’s patch.